We did receive free passes to visit Sharkarosa but all opinions are 100% my own. Visiting DFW or perhaps live in the area? 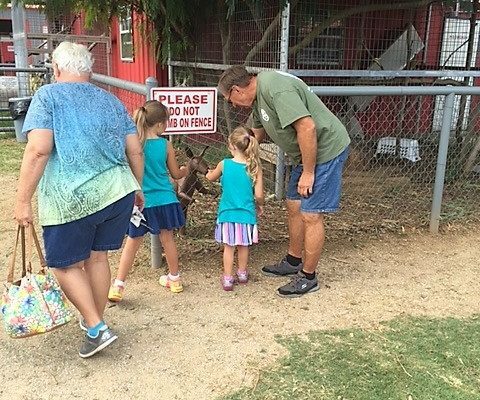 A great idea for the weekend is to head up to Sharkarosa Wildlife Ranch and experience some exotic animals from all around the world face to face! When I say face to face, I mean face to face. 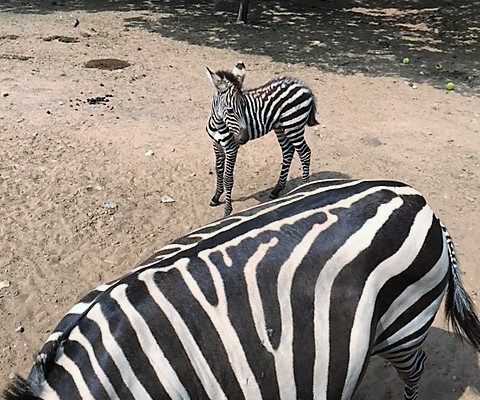 Ever been to the zoo and the animals are way back behind the glass and you really can’t even see them? Not at Sharkarosa! This unique self-proclaimed work in progress facility sits on 126 breath-taking acres and is home to over 100 animals at any given time. The park offers field trips, private tours, open to the public Saturdays and Sundays and rental for events large and small! Every 30 minutes there are also educational presentations in various locations. 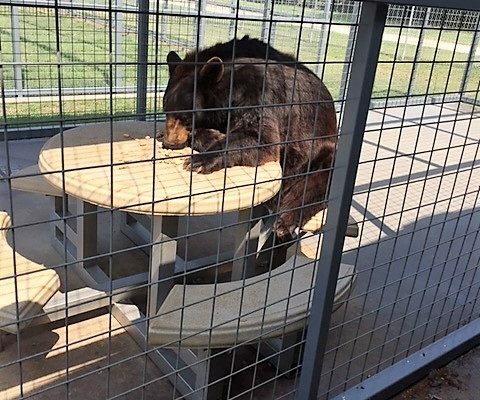 We were able to catch the BEARS, right outside the restaurant! 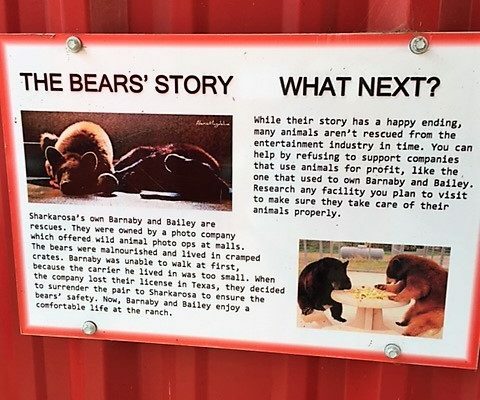 Barnaby and Bailey (brother and and sister) are rescue bears that live there right on site and are pretty cozy! It was awesome! 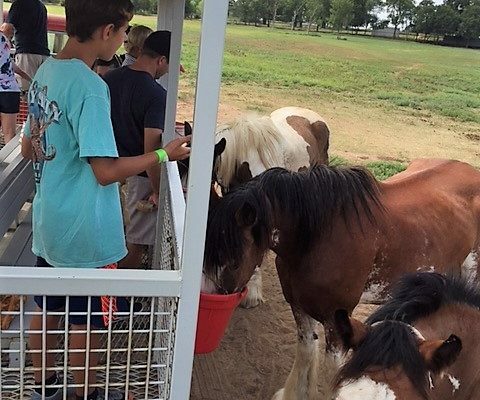 The remaining portion of the ranch is seen on a seated Safari Tram ride that takes you into the habitats of our larger animals such as camels, zebra, Père David’s deer, draft horses, and more. I recommend getting on the tram as soon as you arrive and get this part of your tour out of the way so you can eat or just piddle around at leisure. We got there right at 10:15 and was able to jump on the 10:30 tram with no lines or delay. There are feed buckets on the sides of the tram to place feed in so that the animals will come right up to you. The Tram driver tells jokes and keeps the tour moving and everyone informed about what to do and not do. Sit at the front of the tram as we set in the back and it was sometimes hard to hear. Some animals you can pet, some you can’t. We bought 4 bags of food for $10 and it did come in handy feeding the animals at the petting zoo and on the Tram. My kids had fun on the Kids Barrel train that runs throughout the day upon request and we saw a couple of families using the free picnic grounds having a picnic. The day worked out perfectly. We got off the tram and the Bear show started right away. We then ate at The Bears Den Restaurant and it was truly amazing. Everyone in my party (all 9 of us) enjoyed our food and service very much! They don’t use croutons but cheese puffs on their salads! How cool is that and the pizza is wood fire-grilled right in front of you! 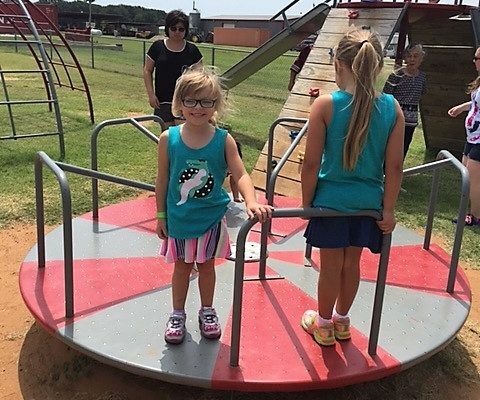 The best part is while we waited for the food, the kids in our party, were able to go right outside the door to an awesome playground and burn off some more energy while we waited! The only thing I would change is on the website, the park offers free admission to military, however, they did not give my Dad a military discount. My father is a Veteran who served his country and has it proudly displayed on his state of Texas drivers licence. They would not accept that as proof, however, since he is not “active” this is what he and many veterans carry as their proof. I wonder if the young girl working the front was just confused? 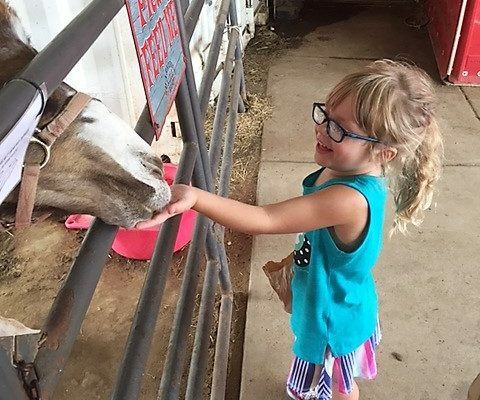 Another thing I would suggest is lower the cost of the pony rides since they were literally 2 minutes for $5. $2 or $3 would be more suitable for what you get but the awesome restaurant and the good time had by all pretty much overshadowed the short pony rides! 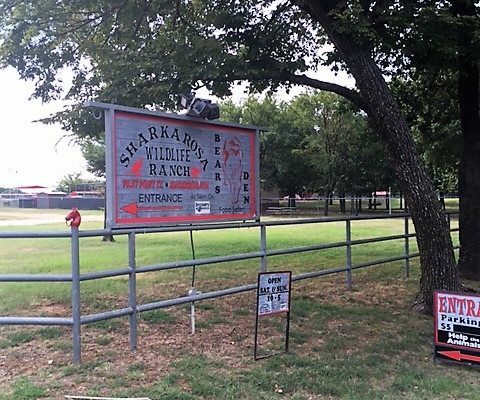 Sharkarosa Ranch is for sure a must see destination for North Texas visitors! Make sure to tell them we sent you! We love coupons so here you go! 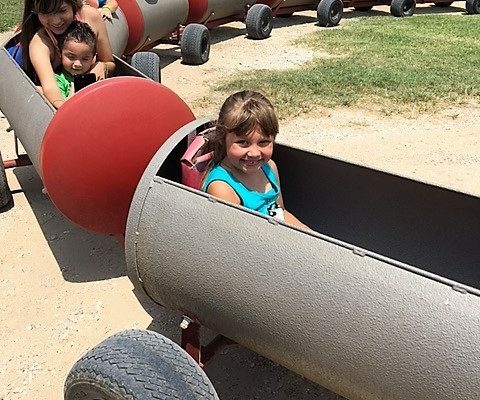 Visit here to print out your $2.00 Off Child Admission – This coupon may be redeemed for $2.00 off one child entry with the purchase of an adult entry. Not valid with any other offer or coupon. Limit two discounted child admissions with the purchase of two full price adult admissions. Make sure you check out our Coupons page for more coupons and offers from our amazing partners!